Katie Taylor’s historic undisputed title fight against Delfine Persoon has been added to the undercard for Anthony Joshua’s US debut against Jarrell Miller, live on Sky Sports Box Office. 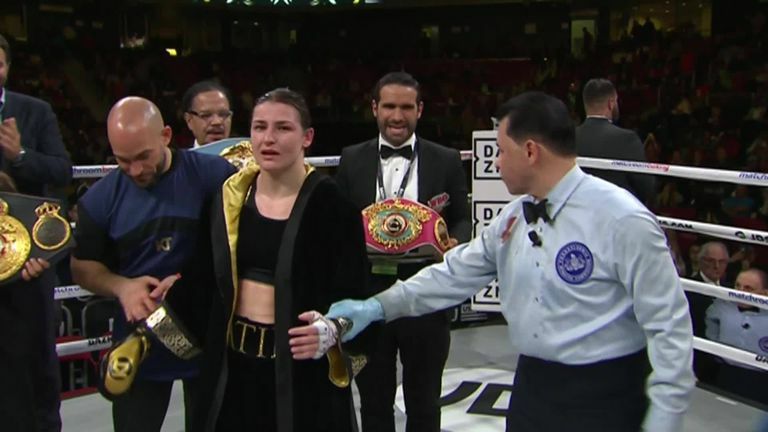 The unified lightweight champion became the first Irish fighter to hold three world titles when she defeated Rose Volante to add the WBO to her WBA and IBF belts, and she will now battle Persoon for the last remaining WBC strap at Madison Square Garden on June 1. Persoon has exerted a dominant reign as WBC champion, stopping Melissa St Vil to retain the belt last March, and her sole defeat was over eight years ago. Taylor said: "It's great that she has finally signed for the fight and I'm delighted that [promoter Eddie Hearn] has been able to make it. "After my fight last month I went back home for a week but then it was straight back to Connecticut to start the hard work in training camp for this fight. "When I turned professional my first goal was to win a world title but then my next priority was to become undisputed champion so obviously this fight gives me the opportunity to do that so it's massive for my career. Women's boxing is in such great place right now and these are the kind of super fights that will really take it to new heights. "Women's boxing is in such great place right now and these are the kind of super fights that will really take it to new heights. Persoon is recognised as one of the best in the world pound-for-pound and has been the WBC champ now for over five years so it's the best against the best. Madison Square Garden seems like the perfect setting for a fight of this magnitude." Persoon said: "This is a very unique opportunity for me and I'm thankful we've got the fight made. I did not have the opportunity to participate in the Olympic Games and now I get the chance to compete with the Olympic champion in Katie Taylor. "I expect this will be a very tough and honest fight, and that the best boxer may win this title fight - and I expect that to be me." Adam Smith, Sky Sports' head of boxing, said: "We're delighted that Katie Taylor's undisputed world title fight has been added to the Anthony Joshua bill, an historic night for Katie on the same evening as the excitement surrounding AJ's US debut at the iconic Madison Square Garden." "We've been there every step of the way since Katie's professional debut and now she attempts to unify all four world lightweight titles, cementing her status as one of finest pound-for-pound fighters in the world. "Delfine Persoon has a very proud record herself and Taylor might have to produce a career-best performance on the biggest night of her exciting career." Hearn added: "This is it - this is everything, the absolute pinnacle of the sport. The dream is on, the undisputed championship and I can't wait to see this fight on June 1. "This is the toughest test of Katie's amateur and pro career, two pound-for-pound greats putting it all on the line at the mecca of boxing - the atmosphere is going to be something else." Taylor produced another punch perfect display against the previously unbeaten Volante, who was floored in the first round before being stopped in the ninth of last month's unification clash in Philadelphia. The 32-year-old has already staked her claim as one of the world's best female fighters and victory over Persoon will mean Taylor matches the achievement of Claressa Shields, who became the undisputed middleweight champion at the weekend. In the main event on June 1, Joshua defends his WBA 'super', IBF and WBO heavyweight titles against 'Big Baby' Miller in his first professional fight on American soil.